Very interesting stuff. Further information from the Romanian wiki page on the village of Macedonia. The settlement was founded by the Macedonian family (Maczedonia, in Hungarian) and already appears in the papal records of the diod (tax) from 1332-1337, under the name of Machadonia. In 1465 he had 50 houses and was owned by Ladislau Doczy (Vasile Doci?). I wish there was some source conected to it. Love to know more about this Ladislau man. 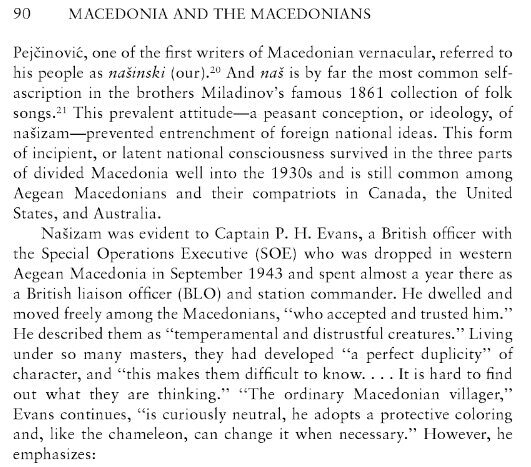 As I have stated before, Victor Friedman cites the 1860s as the beginning of a concrete and widespread Macedonian identity. He categorises Macedonian figures of this period into two factions: Uniates and Separatists (also known as by other writers as "Macedonists"). 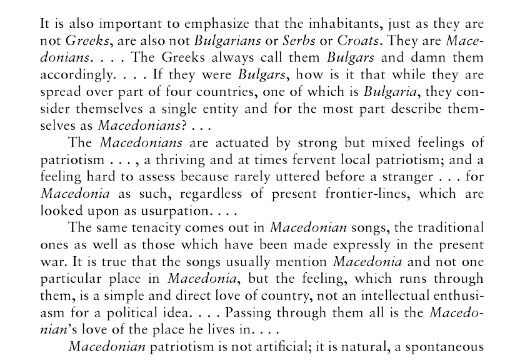 Friedman states that the Uniates continued to believe in a joint Macedo-Bulgarian literary language that would act as a comprise between Macedonian and 'Thraco-Moesian'. The Separatists believed the growing Bulgarian literary language was already too favourable towards 'Thraco-Moesian' and discriminative against Macedonian, and so began to advocate for the formation of an independent literary languages based soley on the dialects of Macedonia, completely independent from the other languages. Carlin, you wouldn't be able to provide the page after the last image would you? Very curious how the author differentiates between those 3 camps they've stated. 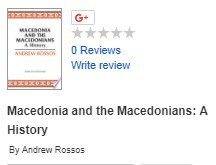 Pretty interesting how the author differentiates between Macedonians who were total bugaromani and those who were more bugarofili. I think most authors (and even Macedonians) put them in the same category. It's worth pointing out also how Rossos claims that those who were totally Pro-Bulgaria and supported San Stefano were very much a minority in the Macedonian national revolutionary movement, the same as those with similar feelings towards Greece and Serbia. But states those with Bulgarian leanings or a general positive bias towards Bulgaira were more numerous but also on roughly equal levels with the "Macedonists" (Macedonian nationalists).